Do you want to start an e-Commerce business in Bangladesh? Here are 10 best tips will help you to run your e-commerce business. You can run your own company from anywhere in the world with e-commerce tools and smart business models if you’re wondering how to start your e-commerce business in Bangladesh. You can even get to the stage where you don’t have to work on a day-to-day basis with the right e-commerce plan and processes in place. And never lift a finger when you outsource all administration tasks to virtual assistants. As an entrepreneur, the post will outline how you can explore the world whilst successfully building an online business. As long as the digital world and devices are changing and becoming more and more practical, e-commerce is an always-changing business. So, in order to be relevant as well as close to its potential customers, an online store must keep up with that. E-commerce business in Bangladesh, also worldwide, is an electronic transaction that’s a buying or selling a service or product online. This business has completed exploded on the internet since last the last couple of years. It’s not only is thriving but is very much the future as well. So, if you’re mentally prepared to build very own website then you need the legal side covered, and many other steps. But, you might be confused thinking where to start from. 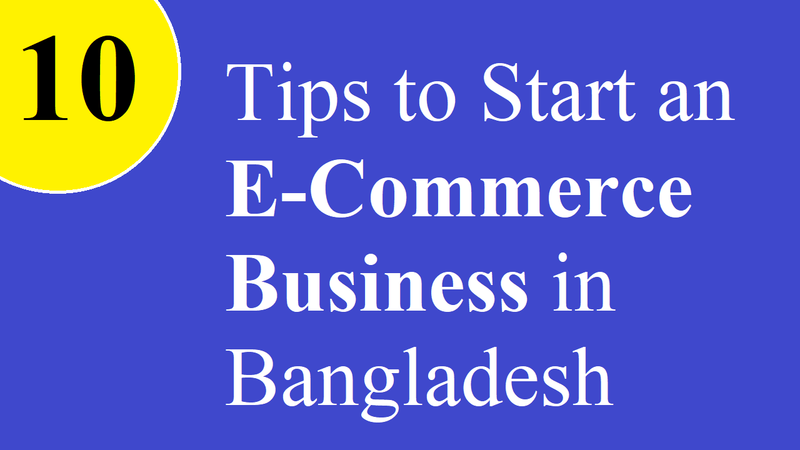 Well, let’s know the steps that are essential tips to start an e-commerce business in Bangladesh. A business plan is the most essential part of your e-commerce business in Bangladesh as it’s vital for all businesses. It does not only come with a formal statement of business goals but plans for reaching them as well. There may include team attempting to reach those goals along with background information about the organization. Also, it’s required importantly when you need to apply for a bank loan or other financing. A 3 to 5-year business plan is required when the existing business is to assume a major change or when planning a new venture. If they like your site or not, and on the other hand, you never get a second chance to make a first impression then it takes about a 50 millisecond for users to decide. And because a first impression can last for years, and it helps you with gaining lifetime customers, you want to be as creative as possible. As you should deliver a nice and visually comfortable experience for users, as well as you make a sell, you need to invest in the best design possible. It’s the inability to let their customers touch, feel and try the product before making a decision are the biggest shortcoming of e-commerce business in Bangladesh. You can cover this deficiency in other areas of your business while there is currently no solution for solving this issue. Also, attracting users and keeps them attached to your site are the best things to do. When you do these extra services and offers, these keep your customer engaged with your site and motivate them to make a purchase. As it can shift your brand image, offering eco-friendly shipping is also a good practice. The average person spends almost 100 minutes a day on their mobile device according to a recent study. You may be thinking you’re there when they were using the internet. Also, you should be one of them who have made their businesses mobile friendly. It means that if your site is mobile friendly then you’ll reach thousands of mobile phone users. As worldwide consumer spending via mobile tablets will play an increasingly important role. So, you may be irrelevant in three to five years if you aren’t building e-commerce businesses with mobile in mind. And if they’re on mobile then be next to your potential customers. One of the worst decision ever for your online business is either neglecting or absent from the social media. This is because social media plays the role of the heart of your business. As it gives you an endless uninterrupted glance to the lives of your customers, you can’t deny it anyway. More and more businesses will be entering this increasingly crowded space as the e-commerce economy experiences a rapid growth. Although there were 2.2 trillion Google searches in the last year, 90% of the users clicked only the first 3 results. That’s why you rely only on the rest 10% to find your site if your product is ranked last on your page. And it looks like building a road without direction when you’re building a website without SEO. So, provide useful and fresh content, improve your website’s loading time optimizing your site’s titles, URL, and descriptions. One of the critical tips that would boost your online efficiency is to plug the right tools to your online store. And it’s essential to have clear and positive data and numbers for you to get the best of your customers. That’s why using the right tools are important to get more clients for your business.